The Talon is a literary arts magazine published twice a year. Review boards select submissions of art, photography, poetry, fiction and nonfiction from the school community, and editors design and publish work in an award-winning magazine. View the awards given by Columbia Scholastic Press Association to the Talon for excellence in the field of student publishing. 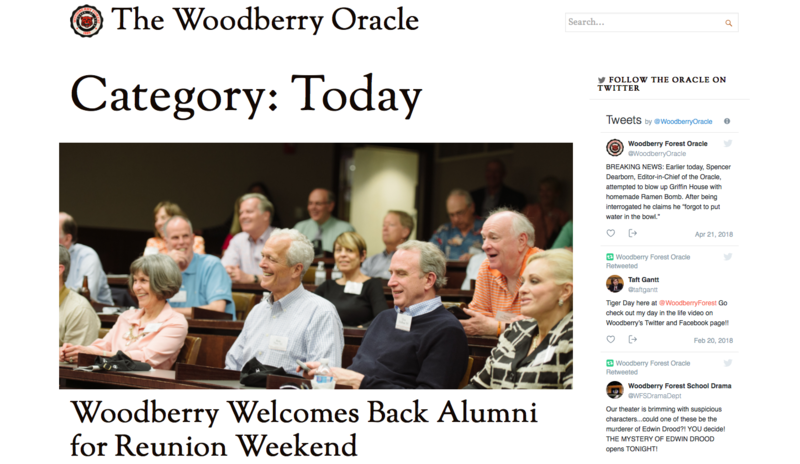 Woodberry Forest School's student-run newspaper, The Oracle, now resides online. Student writers are committed to highlighting today's events, reprinting articles from past issues of The Oracle, providing a look behind the scenes of campus, sharing opinion, covering athletics, and entertaining with humor.